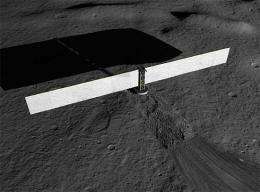 (PhysOrg.com) -- The first nuclear power plant being considered for production of electricity for manned or unmanned bases on the Moon, Mars and other planets may really look like it came from outer space, according to a leader of the project who spoke here today at the 242nd National Meeting & Exposition of the American Chemical Society (ACS). James E. Werner said that innovative fission technology for surface power applications is far different from the familiar terrestrial nuclear power stations, which sprawl over huge tracts of land and have large structures such as cooling towers. "People would never recognize the fission power system as a nuclear power reactor," said Werner. "The reactor itself may be about 1 1/2 feet wide by 2 1/2 feet high, about the size of a carry-on suitcase. There are no cooling towers. A fission power system is a compact, reliable, safe system that may be critical to the establishment of outposts or habitats on other planets. Fission power technology can be applied on Earth's Moon, on Mars, or wherever NASA sees the need for continuous power." The team is scheduled to build a technology demonstration unit in 2012. This is a cooperative project between the National Aeronautics and Space Administration (NASA) and the U.S. Department of Energy (DOE). Werner leads the DOE's Idaho National Laboratory involvement in this effort, which includes participation in the reactor design and modeling teams, fuel development and fabrication and development of a small electrical pump for the liquid metal cooled system. Sunlight and fuel cells were the mainstays for generating electricity for space missions in the past, but engineers realized that solar energy has limitations. Solar cells do a great job supplying electricity in near-Earth orbits and for satellite-borne equipment, but nuclear power offers some unique capabilities that could support manned outposts on other planets or moons. "The biggest difference between solar and nuclear reactors is that nuclear reactors can produce power in any environment," Werner explained. "Fission power technology doesn't rely on sunlight, making it able to produce large, steady amounts of power at night or in harsh environments like those found on the Moon or Mars. A fission power system on the Moon could generate 40 kilowatts or more of electric power, approximately the same amount of energy needed to power eight houses on Earth." In addition, he said that a fission power system could operate in a variety of locations such as in craters, canyons or caves. Fission power systems rely on energy generated from nuclear fission. Nuclear fission works by splitting uranium atoms to generate heat that is then converted into electric power. The primary components of a fission power system are similar to those found in the commercial reactors currently in use: a heat source, power conversion, heat rejection and power conditioning and distribution. Wake up and smell the coffee -- on the Moon! This looks like perfect fit for H3 which is plentiful on the moon. They're talking about nuclear fission here, not fusion. There's gonna be very little need about H3. Safe passive small modular nuclear reactor is the best way to provide power for space exploration. Maybe they can even use nuclear power propulsion system to aid in space flight. Don't use the outdate nuclear technology that we have right now but the latest & safest design in nuclear power technology. In fact the present nuclear reactors should be dismantle slowly and be replace with the latest, safest nuclear technology. Look at what happen in Japan nuclear disaster with their outdated nuclear reactor. That reactor was so outdated and flaw in design that it was retrofit to, supposedly, meet minimum safety standard. If they had dismantle all these outdated nuclear reactors, regardless of the economic cost, and replace it with the latest & safest nuclear reactor, the Japan nuclear disaster would have never happen. It is about time that they consider using nuclear power for space travel and exploration. H3 is plentiful on the moon pretty much like gold is plentiful in the oceans. In total there is a staggering amount, but its pretty dilute. This is so cool. Here's hoping that I'm one of the few that get to be aboard the first manned moon station. Look what happened not ONLY in japan, but in america as well. 3 power plants melted down to damned near critical safety measures. Oklahoma Arizona and Nebraska I believe is the states... If you Haven't heard about them, it's probably becuase Obama ordered a media blackout on them. What a A good fella, eh? The best nuclear power of future will be the kind that is used in Rossi E-Cat. Safe, small and affordable. Once it's out, no other tech is anymore considered. Sculpture, you're a moron. Most of the nuclear plants that are running today are more then 60 years old which is why it was so bad. Also, Japan's nuclear plant was built to withstand an 8 magnitude earthquake and it got hit with one 100 times stronger (if I remember correctly). i think about 80 times more powerful(7 vs 9.8 on a log scale). But remember it wasnt the earthquake which caused the problems, it was the tsunami. Clearly the reactors were well built for their age, pity about the lack of waterproof back up power for the cooling pumps. Also the greenies refusal to allow spent fuel rods to be transported to safe locations and instead demanding they stay in pools above the reactors caused problems. If the spend fuel rods were transported to geologically stable regions for recycling Fukishima would have been somewhat better. Still bad. "Weight is also a significant factor that must be minimized in a space reactor that is not considered in a commercial reactor." Sure it might take baby steps right now but I believe using current launch vehicles we could send up a modified nuclear powered tunnel borer and start a small underground habitat that would be suitable for miners and workers. Then work could start on building, from the ground up, a "new earth" with next gen. foundries and manufacturing facilities. Pretty soon we could colonize the surface or near surface using simple greenhouses made with 2 layers of glass and a sufficient amount of static water between them to keep you safe from radiation. Heck I have a feeling if there are any alien artifacts to be found up there it would make the whole trip worth it. Also the greenies refusal to allow spent fuel rods to be transported to safe locations and instead demanding they stay in pools above the reactors caused problems. Add to that that there is no 'safe' storage anywhere on the planet for spent fuel rods. The areas that were said to be safe for thousands of years (salt mines) are already leaking after 40 years. The first step should be building in an area that is not at a major risk of natural disasters. Shores are prone to tsunamis. there was no long term plan. so it is better to assume we are bad at long term planning and just force ourselves to go 'small' . that way when changes are eventually needed, it will be easier to make them, unit by unit. I thought one of the major blocks to nuclear power in space was the actual delivery of uranium into/past orbit. Politically, concerns regarding the explosion of a rocket with a uranium payload are difficult to get around. No so much uranium, but the plutonium that powered the spacecraft that have power needs beyond that which can be provided by solar panels. When those craft were launched, there were many protests for fear of an accident which might release the plutonium into the atmosphere. However, the plutonium was well shielded and, according to those that"knew", the container could not be blown apart by a launch accident. So far, they were correct, and I hope they continue to be. If you are really interested in how this subject came to fruition within NASA, you should probably contact the man that started it. Kirk Sorensen runs energyfromthorium.com and he's pretty much the one man that re-started the entire concept of the liquid metals/liquid salts nuclear reactor within NASA while he worked there. If China is successful with their LFTR, it will certainly be because of Kirk Sorensen's work. Any discussion of this technology should reference the work at Oak Ridge in the 60's and Kirk Sorensen and his work within NASA. Another article which is high on hype and low on detail. Light weight nukes and reliable metal pumping should be facinating, not empty of detail.